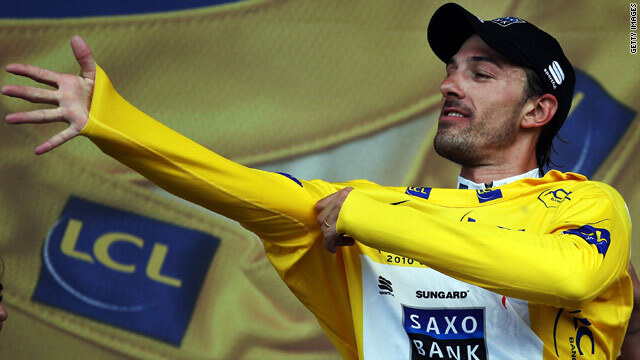 Fabian Cancellara tries on the leader's yellow jersey after winning the Tour de France prologue on Saturday. (CNN) -- World time-trial champion Fabian Cancellara has won the opening yellow jersey of the Tour de France for the third time in six years as cycling's premier event began with a prologue in the Netherlands on Saturday. The Swiss rider was the third-to-last of the 197 competitors to tackle the 8.9-kilometer time trial in Rotterdam as the 97th edition of the race got under way in wet conditions. Germany's Tony Martin had set the fastest time of 10 minutes and 10 seconds for the Columbia team as the 11th rider out, and that stood until Saxo Bank's Cancellara set 10:00.480 to follow up his efforts in 2004 and 2009. Britain's David Millar took third place for the Garmin team in a time of 10:20 while seven-time champion Lance Armstrong, starting his final Tour, was fourth for RadioShack another two seconds back. Two-time defending champion Alberto Contador was sixth in 10:27 for Astana behind Team Sky's British rider Geraint Thomas, with Americans Tyler Farrar and Levi Leipheimer seventh and eighth. Britain's Olympic pursuit champion Bradley Wiggins, who was fourth overall last year, was a disappointing 56 seconds off the leading pace as leader of Team Sky. Giro D'Italia champion Ivan Basso and highly-rated Russian rider Denis Menchov were also in a similar position. Climbing specialist Andy Schleck, another rider expected to contend for the title, was more than a minute adrift back in 122nd. It was the first time the prologue had been held since the 2007 race, which began in London. Sunday's first stage is a 223.5-kilometer run from Rotterdam to the Belgian capital of Brussels -- the start of 20 legs concluding with the victory leg into Paris on July 25.